Fugly Horse of the Day: The fluff - it's between your ears! 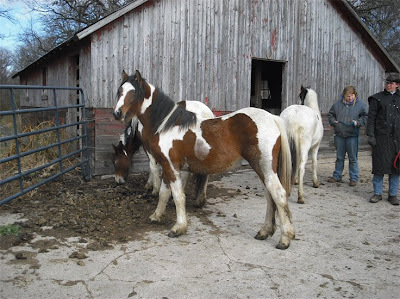 "We have two bay pinto daughters of Toymakker born May 2007 who ended up back in the pasture with him fall 2008 and yes, they are confirmed ultrasound pregnancy for 3/4 gypsy cob babies due late August, 2009. An opportunity for very hairy babies at a reasonable price." Gosh, they just "ended up" back in the pasture with him! Golly gee, they really love their father, ha ha ha. Isn't that kyooooot? *sigh* Have you people never heard of (a) good fence or (b) Lutalyse? Now you have two pregnant yearlings - that's good for them - and you're going to produce two foals where the best thing that even YOU can say about them is that they're going to be very HAIRY! And of course they are going to be 75% a stallion whose dam's pedigree they don't even know (actual quote: "ANYONE OVERSEAS THAT CAN HELP WITH PEDIGREES WELCOME")...out of fillies who are all of halter broke. Kinda. But hey, logic doesn't need to enter into anything here, because the whole premise of the web site is that they have "ponies for grownies!" That's a quote. And they can't wait to tell you all about those ponies. "Gypsy horses and ponies traditionally are sound animals for riding and driving, and are calm enough to be safely handled by women and children." No, REALLY? OMG. 'Cause all of the other breeds of horse eat women and children. For lunch. With ketchup. Of course there's plenty of blathering about how rare these horses are. You know, they may not be as common as Quarter Horses just yet, but if this kind of crap keeps up, I can quite assure you they'll be at the auctions on their way to becoming a Vanner Burger in just a few short years. How kyooot is that?